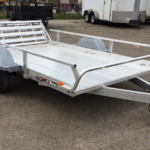 The best 6’x12′ open UTV trailer available! 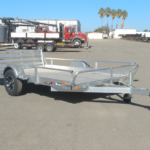 This trailer was designed for hauling UTV’s. With it’s all-aluminum construction, it’s also popular for hauling motorcycles, ATVs, lawn equipment, golf carts or even a small tractor. The 6ft wide deck easily handles most side-by-sides. The AUT1272 has a very low deck height thanks to the torsion axle suspension. That’s what makes it so stable and smooth towing. Because it’s all-aluminum, it’s very lightweight and strong and it stays looking great for many years because there’s no paint to fade and chip. You can easily grab the tongue with one hand and move it around where ever you want. It’s super easy to load and tows beautifully behind even a small car. The AUT1272 is the next size up from our AUT1064.